As the name would suggest Dale Head sits at the head of the Newlands Valley, although this isn't immediately clear on the ground - the side valley of Keskadale is longer, contains the main valley road and ends at Newlands Hause, but Newlands Beck rises on the eastern slopes of Dale Head and flows north down the main Newlands Valley. The fell is at is most impressive when seen from the Newlands Valley, where its crags loom above the head of the valley. From Buttermere and the road up Honister Pass it rather merges into the long northern flank of the valley, with little to distinguish between Robinson, Hindscarth and Dale Head when seen from below. From further up it is clear that Dale Head sits at the end of this ridge, and its eastern face looks out towards Borrowdale. The fell isn't really visible from the valley bottom in Borrowdale, and is hidden behind High Scawdel. 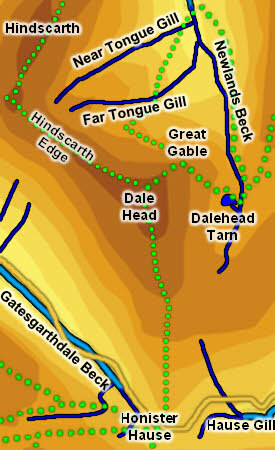 There are four routes to the stop of Dale Head. The easiest ascent comes from the south and follows a fence line from the top of Honister Pass straight to the summit. This is one of the easiest routes to the top of any major fell, with the car doing a large part of the work. Be aware of the quarry on the western side of the old fence line. A steep but well built path climbs up the eastern flank of the fell, starting at Dalehead Tarn. It no longer follows the line of the right of way, but instead follows a less direct (and less steep) route that heads north-west towards Dalehead Crags then south-west to the summit. This route thus joins the northern route, which follows an old mine track from the valley bottom then cuts across a ledge in the northern crags to reach the top of Dalehead Crags (I haven't used this path yet, but I have seen people complete this climb). Finally the summit can be reached from the west along Hindscarth Edge. We have a circular walking starting at Little Town in the Newlands Valley that visits the summit of Dale Head. The summit sits at the top of the cliffs facing the Newlands Valley, so to the north there is a sudden drop while in every other direction there are more gentle slopes. The summit is dominated by a large cairn that sits almost on the brink, and offers spectacular views down Newlands. The eastern boundary of the fell is formed by Newlands Beck, which rises in a bowl in the hills between Dale Head and High Scawdel. In the south the fell can claim a small stretch of Hause Gill as it flows east down Little Gatesgarthdale on its way into Borrowdale and a rather larger stretch of Gatesgarthdale Beck as it flows west towards Buttermere. A number of unnamed backs flow down the southern slopes of the fell to flow into these becks. The northern boundary is formed by Far Tongue Gill, which rises at the western end of Hindscarth Edge, then flows east across the face of Dale Head before turning north to flow into Newlands Beck. Dale Head has been the site of mining and quarrying, with levels and quarries overlooking Honister Hause and more workings at the head of Newlands.